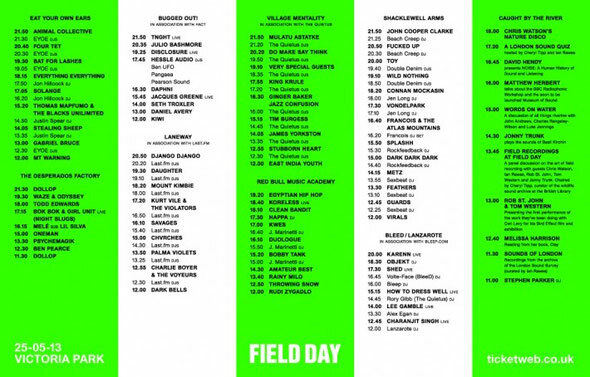 The official Field Day after-party was recently confirmed and will take place at a secret location in Hackney just after the end of the festival. The venue is only 15 minutes walk from the festival and kicks off when the festival ends, running through until 6am. The first announcement includes Hessle Audio top gun and Rinse regular Pearson Sound; no stranger to Hessle himself is Berlin based Objekt who has also remixed Radiohead and SBTRKT. Joining them is Daniel Avery who hit big with his EPs for Phantasy last year - and who has been lauded as a DJ by Andrew Weatherall no less - and BleeD's Volte-Face, responsible for a volley of underground nights across London. There is another very special guest to announce closer to the date. 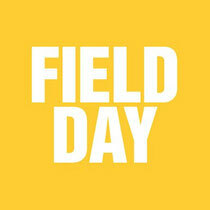 Field Day takes place at Victoria Park in London on Saturday May 25.